Off course there is a huge difference with becoming Enlightened in a way that frees your soul, but working with a computer this version of Enlightenment comes a good way. In February I was asked to write an article for OpenSource.com on Desktop Environments. Being a Social Sciences Nerd and not that bald a coder, a Desktop Environment for me is the prime interaction between human and machine. Distro’s are just a bundle of software and routines, and the .deb/.rpm discussion is useless in an end user’s perspective — it just installs the updates and removes the leaves. Writing this article I surfed the Net and together with my own experience I compiled a story recommending a few of the widely known desktops. Until someone pointed me at Enlightenment. In fact ‘e’ is a kind of window manager and not a complete Desktop Environment. For a while I tried Enlightenment besides the Fedora 20 LXDE on my main machine. Soon I discovered and liked the cleanness and responsiveness of ‘e’. LXDE is very swift because it doen’t provide all the eye candy that comes with the larger Desktop Environments. In previous years I developed my own set of key-bindings and routines. Enlightenment first came a bit of a shock: all the shortcuts I was used to didn’t work and I had to search for the usual accents (Dutch uses quite a lot of them) and the € sign. Here the explanation on the Bodhi Linux Documentation came handy and provided the basic needs. But then the eye candy, and I mean Eye Candy! Enlightenment is not only more responsive than LXDE, but it also provides a beautiful surrounding to work in — and at no CPU-cost! Now Enlightenment was planned for Fedora 19 and provided in the default repo with Fedora 20. But the Fedora way, some things are Bleedin’ Edge where other things come a bit behind. The beauty of Linux is that you are never alone with your questions and the Copr Project of Fedora provides an up to date repository for Enlightenment in Fedora. The shift from the basic 0.17 to 0.18.5 was huge! Everything works much better and in the last weeks I had no crashes. Great! But ‘e’ has more than different looks! Enlightenments own terminal Terminology comes with a few special commands: often used regular Linux/Unix commands but with a leading ‘ty’. This way you can preview pictures and pdf’s with the ‘ls’ command by using ‘tyls’. Having a full view in terminal just type ‘tycat <file_name>’ and you get a full colour picture in terminal. You can also click on the preview image in the ‘tyls’ output or type ‘typop <file_name>’ — in both ways you get a pop-up with the chosen picture. Just surf around to discover the tricks for these nifty features, since the documentation on Enlightenment and its parts is more technical than end user orientated. Maybe not that useful IYHO, but it is Fun and great to work with! 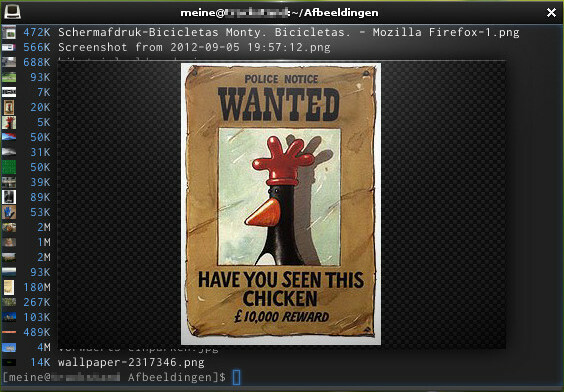 This entry was posted on 11 May 2014 at 22:09 and is filed under Linux. You can follow any responses to this entry through the RSS 2.0 feed. You can leave a response, or trackback from your own site. this blog only requires some inspiration for writing, no programming skills needed unless you want to write about it ;-) just get a free account — I guess you can make one at wordpress.com or another blogging service — and start writing on a bunch of your favourite topics. most of the pictures I use are screenshots or from my cellphone and scaled/clipped with a graphical program like GIMP (http://www.gimp.org/).